Looks like there's an error in the flavor text around "Joe". In-game appears as ?Joe?, here on Wowhead it's �Joe�. This is part of a requirement* for Les chants de la mer from the rare, Barman Bill. Beyond that, it has no apparent other use. *Incorrectly used meta, since meta technically means an achievement for an achievement, and this is only a requirement for an achievement. Chant de marins interdit : Joséphus drops from Tavernier Bill rare which is located in Freehold. Item is a part of Les chants de la mer achievement. The nationalities of the girls met and their specific problems vary based on the prejudices of the singer and crew, naturally. It's also worth keeping in mind that most of the versions of shanties we've inherited have been sanitized in various ways, so the original lyrics were probably a bit more explicit. that's pretty high isn't it? 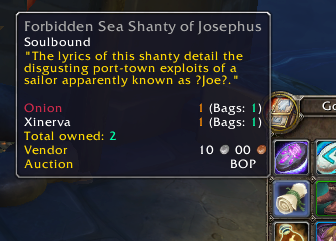 I don't know how long this has been a thing, but I just noticed my Sea Shanty item turned into a gray! Anyone know what this means? Picture here! Make sure to loot the Shanty when it drops on the first kill of this mob. It looks like he will not drop it on subsequent kills. So if you don't loot him or forget to loot the item on your first kill you might miss this item and won't be able to complete the achievement at this time. I hope blizzard will fix this fast. I reckon this is happening because he is a rare mob, and due to that his loot is considered one time only. Sadly the Shanty is not mailed to you if this happens by the postmaster. Is this just garbage, now? It seems it's just a gray drop with no purpose. "Les paroles de ce chant reprennent les exploits portuaires peu ragoûtants d’un marin connu sous le nom de Joe."